A report published last Friday by the Department of Energy and Climate Change shows that while production of fossil fuels in the UK fell by 10.1% with both oil and natural gas production plummeting by 12.2% and 13.9% respectively, renewables generation increased by 6.5% in the second quarter of 2012, in comparison to the same period of the previous year. General figures reveal that energy consumption in the UK increased by 5.1%, largely driven by a 32.8% increase in domestic energy consumption from last year, which saw much milder weather. DECC has also revealed that electricity and gas prices kept on increasing, with a 5.5% and a 13% rise respectively. 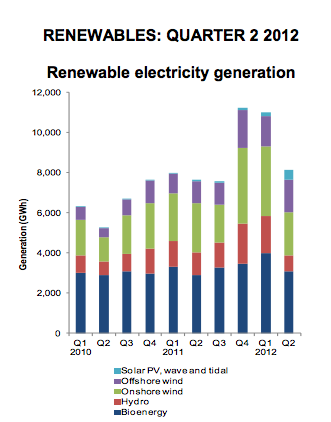 Regarding renewable energy results, renewables’ share of electricity generation increased from 9% in the second quarter of 2011, to 9.6% in the second quarter of 2012. Generation from solar energy increased from 0.05 TWh to 0.5 TWh – around 840% – and low wind speeds and rainfall led to falls in onshore wind and hydro generation respectively. Renewable electricity capacity increased 42.4%, standing at 14.2 GW at the end of the second quarter of 2012. In England, the region with the largest renewable capacity is the East, where over half comes from bioenergy and 31% of capacity is from wind. When combined, the South East, North West and East regions account for nearly two-thirds of England’s renewable capacity. On the other hand, London and the West Midlands have the lowest capacities.